Itay Mendelawy is Product Manager at BlazeMeter. Prior to joining BlazeMeter, Itay was a Sysadmin and Devops consultant at Devops Israel, focusing on the development of agile and devops methodologies. Itay also spent several years as a programmer and integrator at Bank Hapoalim for CyberArk products designing and developing systems for secure server management. Itay began his career with 5 years as a Systems IT/Programmer in the Israeli Defense Forces. Welcome to part 4 of our “Understanding Your Reports” series. In part 1, we talked about what KPIs are in the context of Performance Testing. In part 2, we went over KPI correlations. In part 3, we explained basic statistics. 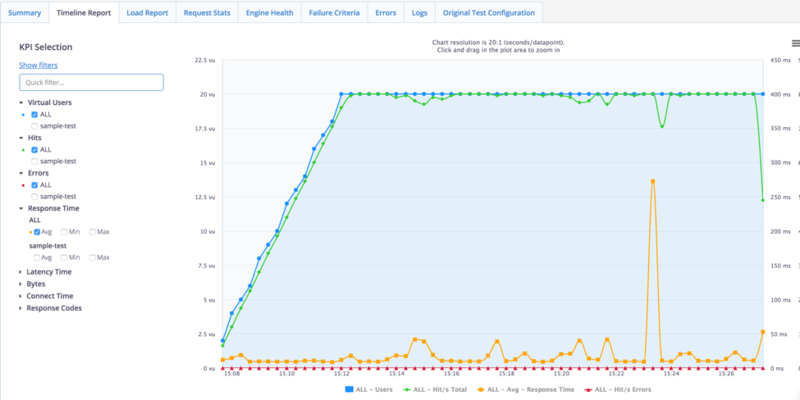 This time, we will see how this knowledge can be implemented into analyzing your load testing reports on BlazeMeter. Reports are important for viewing the summary of each test and analyzing the trends and statistics. The Summary Report, as can be understood by its name, displays a summary of the test. The top part of the dashboard presents statistics, and the bottom shows trends. The statistics shown here are the general parameters that we at BlazeMeter believe are the most valuable for a first glance and overview. - Maximum Users - The Maximum number of Virtual Users that were tested. This is important for understanding your site or app’s load capabilities. - Average Throughput - The average number of Hits per Second per user during the test. This is important for understanding the amount of traffic your site or app can handle. - Errors - The error percentage out of all requests. This is important for understanding if your site or app works properly, or not. - Average Response Time - How long, in milliseconds, did it take the average user to receive a response for their request. This is important for measuring and understanding your users’ experience when using your site or app. - 90% Response Time - The slowest response time, in milliseconds, the 90th percentile receives. This is important for measuring and understanding the majority of your users’ experience, when using your site or app, excluding extreme incidents. - Average Bandwidth - The average amount of data transferred in KIB. This helps to understand the typical network load on your servers during high traffic scenarios. The bottom part of the dashboard displays KPI trends. For more information about reading these reports, see part 2 of this series. This data can be exported to PDF and shared as an executive summary. It is also shareable among team members with the right permissions. The Request Stats Report provides you with even more statistics than those shown on the board. These statistics are shown for each transaction that occurred during the test, as well as for the top-level user experience. Users can determine the time of the test they want to examine, on the Time Slider above the table. The data is displayed in a table, which can also be downloaded in CSV format. Users can also choose which statistics they want to view. These are the available statistics (the report displays them per transaction). - Average Response Time - How long, in milliseconds, did it take the average user to receive a response for their request. - Average Hit/s - The average number of Hits per Second per transaction during the test. - Average Latency (ms) - The average time in milliseconds from before sending the request to just after receiving the first response. - Geo Mean Response Time (MS) - Geometric mean response time. This KPI is important for understanding the general health of systems, and excluding anomalies. The Timeline Report shows us statistical trends over time, visually. Users can view different types of KPIs, analyze how they changed over time, and correlate them together. The results are shown in a graph. For more information about reading these reports, see part 2 of this series. You can zoom into a 1 second granularity of the data. The left panel of the report offers a tree view of all the KPIs that were calculated and measured during the test on each label or transaction. The filter lets you quickly find the KPI or label you are looking for and plot it on the graph that appears on the right. After viewing and analyzing your results, you can export the graph as an image for any purpose you might need. Congratulations! 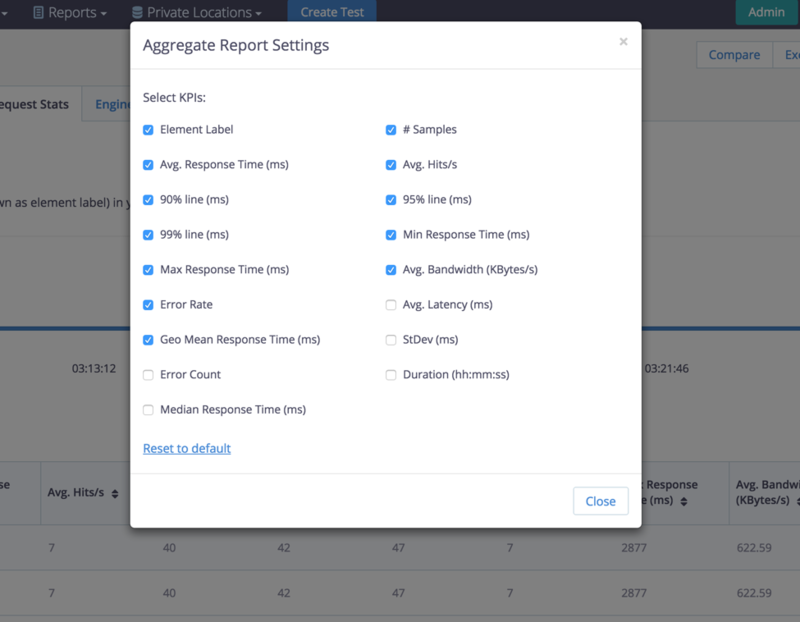 You can now read and analyze BlazeMeter’s KPI reports. Stay tuned for next time. Want to learn more about the latest BlazeMeter features and capabilities? Register to view our webinar - Performance Testing with BlazeMeter - New and Advanced Features.